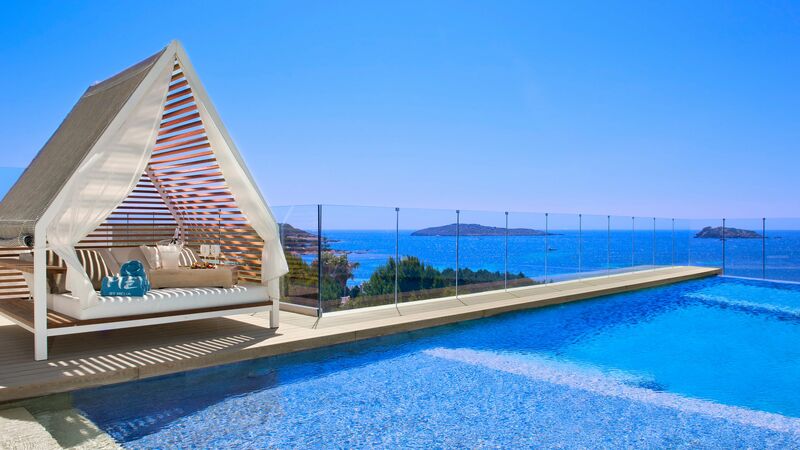 Located in S'Argamassa close to Santa Eulalia, the ME Ibiza combines modern and minimalist interiors with spacious design and stunning views of the sea. Opened in 2014 as a stylish and ultra modern addition to Ibiza's hotels, the ME Ibiza is part of the popular Meliá hotel group. The hotel features a roof top pool with 360° views of the bay and the mountains with Bali Beds available. The bars and restaurants feature live DJs so you can enjoy the Ibiza lifestyle in the luxurious surroundings of the hotel. There is a wide range of facilities including a gym which is open 24-hours a day and the SkinC SPA and relaxation areas on the roof. Rooms are contemporary in design combining modern comforts and style. The hotel is the first hotel in Ibiza to become part of 'The Leading Hotels of the World' and reached this status within a month of opening. Rooftop Infinity Pool with a lively experience for adults only, ground floor pool for guests aged 12 and over and a separate children's pool for the youngest guests. A contemporary Mediterranean bar and restaurant concept located on the ground floor, offering a delicious selection of Spanish inspired dishes, including traditional seafood paella, Mediterranean tapas and stone oven-baked pizza al forno. Salt & Sea's fresh and healthy menu is also complimented by refreshing cocktails. Enjoy the ultimate rooftop experience, with stunning 360º views, fresh seafood, delicious cocktails and upbeat music to create the perfect beachfront vibe. 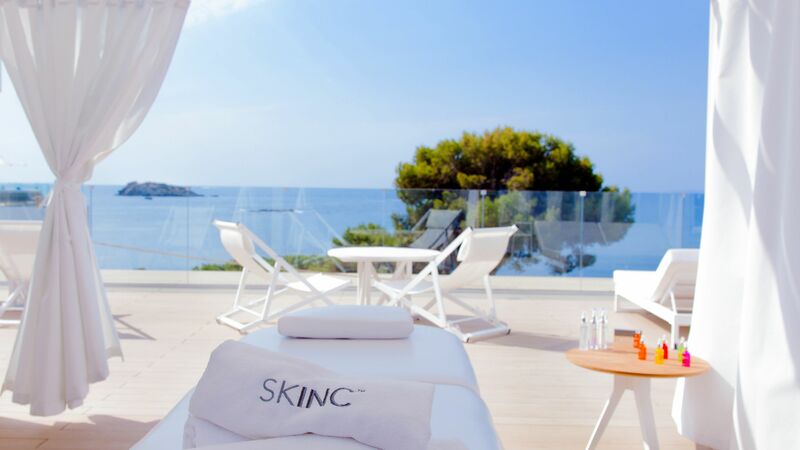 Guests can enjoy the rooftop relaxation area with 360º views or indulge in a rejuvenating treatment at the SkinC Spa. Nestled on Ibiza's north-east coast, S'Argamassa is all about the beach. Close to popular Santa Eulalia, this pretty little resort revolves around a secluded bay divided into small sandy coves, with a shallow shore that's perfect for swimming. A local watersports centre will sort out water-skiing or jet skis if you fancy some excitement. 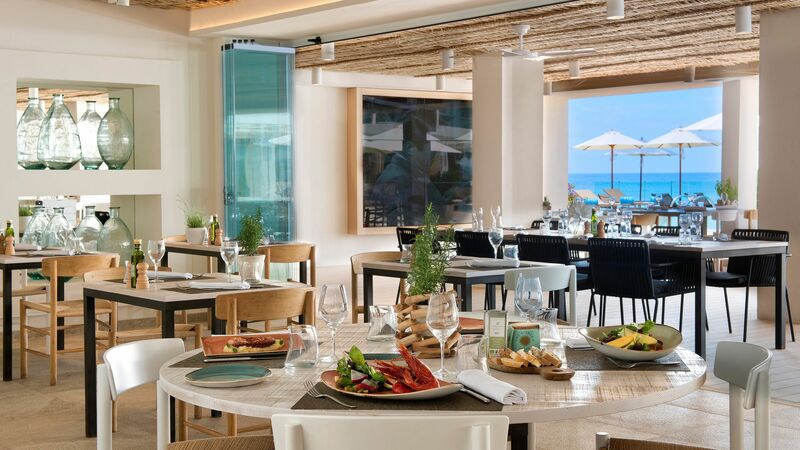 Otherwise, sink into S'Argamassa's laid-back pace with a cold drink and a bowl of seafood paella in a beachfront cafe. The main street has a little more hustle and bustle, with some good shops and restaurants, but if it's serious shopping you're after, head for the hippy market. S'Argamassa is just two kilometres from Es Cana, and the market is its biggest draw. A throwback to Ibiza's artistic roots, the colourful stalls showcase local handicrafts, jewellery and hippy clothing every Wednesday throughout summer. Double Rooms are situated on the first and second floors with views of the Cala Martina area. They feature a king size or twin beds, a rain shower, mood lighting, a flat screen TV, bathrobes and slippers, air conditioning, a hairdryer, minibar and safe. Double Premium Sea View rooms are located on floors 1 to 3 and have a view of Nikki Beach and a partial sea view. Double Deluxe Sea View rooms are located on floors 1-3 have a wonderful view and face the pool. Suite Sea Views have a full sea view and feature sea view baths, coffee makers and ceramic hair straighteners. Save up to 25% on the hotel price for holidays between 17 April - 31 May 2019. Save up to 15% on the hotel price for holidays between 01 - 30 June 2019. Save up to 30% on the hotel price for holidays between 01 - 31 July 2019. Save up to 35% on the hotel price for holidays between 01 August - 26 October 2019. Offers are valid when booked by 30 April 2019. Honeymooners will receive a Bali Bed at the pool area including a bottle of local Champagne and a complimentary upgrade to Superior accommodation (subject to availability) when staying for a minimum of 5 nights, wedding certificate is to be presented upon check in and should not be older than 2 months. I am writing this review at least half a year after my stay, so what was memorable? The free flowing champagne at the breakfast buffet (which I wish I could have indulged in more but I couldn't imagine having anything other than coffee with my breakfast), free entry into Nikki Beach next door, fantastic paella on the beach a few yards away off the property (we asked the staff "where do you go to eat?"). Ibiza is all about the music, so they have great music playing around the pool. This is really an adults resort, a place i would go with teenage/adult kids. I don't think really young kids would get much out of it. “ For guests who want to party, but also come back and relax! The hotel is in the North of the island in a quiet bay. Despite this it is only around half an hour to get to the mega clubs of Ibiza Town. The setting is beautiful and the pool area is a great place to chill out. They also have an infinity pool on the roof and several Jacuzzis. This hotel suits people that do want to party in Ibiza (all of the guests seemed to be in their 30?? ?s) but also want somewhere relatively relaxed to come back to. Great fine dining restaurant on the roof. The property does feel very chilled but there is loud music constantly coming from the pool side bar as well as the famous Nikki Beach Club next door, so might not be for everyone. Small beach at the property but a really nice setting! We had a Mode Suite, which had a lovely view over the pool and sea! Rooms are very funky! I stayed here for 4 nights at the end of last September - it was perfect for what we were after - just relaxing by the pool and sunbathing. Overall this was a lovely stay - most staff were wonderful, the facilities, breakfast and our room were generally of a high standard. Maybe not quite as good as other luxury hotels I've stayed in such as the MO or Kempinski but not far off. As mentioned in a few other reviews there are a few little niggles which means given that they market themselves as one of the leading hotels of the world they do fall a little short. The shower in our room did not work properly and when it did the water pressure was pretty awful. Breakfast is buffet self serve style, and one staff member impatiently snatched the still yet to boil kettle from its stand whilst a few of is guests were waiting for it to boil, even though we stated we were waiting for it to boil. Not the type of behaviour I'd expect from staff at a luxury hotel. It is indeed a little strange that after paying a premium to actually stay at the hotel - guests indeed can not actually use the rooftop pool without paying an additional charge - I guess this maybe because they allow day guests in to use their facilities too at the expense of staying guests. The "normal" pool by the breakfast area was nice and there were sometimes not enough sunbeds available but it had a nice vibe about it with music playing and guests relaxing or drinking and dancing without being overly pool partylike. Would recommend staying if you're looking for somewhere a little quieter in Ibiza and you just want to relax and sunbathe. This hotel did have a very couple vibe although we did see some solo guests. I loved the chic vibe of this seaside resort. The lobby exudes a feeling of effortless luxury with its well-curated artwork and eclectic decor. Most of the bedrooms have views of the water. The breakfast spread is also quite huge. The poolside is really the heart of the resort. It's the perfect place to soak up the sun! i stayed at the Me Ibiza last October, the hotel was clothing the day of my departure. I wen t to the breakfast half an hourand put the "do not disturb" in front of my room, when i came back my engagement ring was missing ! what the hotel tell me now from one month and half i that there is no camera and so, no proof and the theft and that they were closing my file ! seriuously ? so you are the kind of 5 stars hotel which let their staff steal in the room of their client , without doing anything ? from one mont i have just email from a person from the staff which send myself packing , and any answer from melia group or a director to help me with such a lost !! also, other of my friends had been stolen stuff in their own room , not so valuable but, you are a hotel of robbers , it is chocking for that kind of hotel.